Ten metres above, the glassy ceiling of the Indian Ocean glints and and shimmers while below the warm turquoise of the Maldives fades into an infinite blue. Nearby, canoes and snorkellers paddle on the glittering ceiling while scuba-explorers plumb the depths of the archipelago’s coral kingdom. Here, you wait between one world and the other at Anantara in South Male’ atoll. Having free-dived down, your lungs are squeezed to half of their normal capacity as the weight of paradise brings two bars of pressure (the exact opposite effect of the ones serving cocktails on the resort) – but you feel calm. 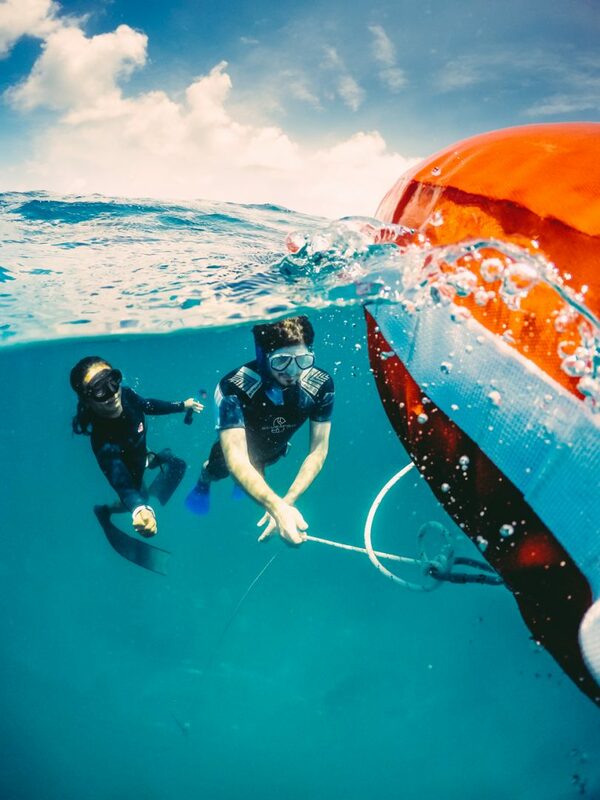 After spending an hour with Mari – your PADI-trained free-diving instructor – by the pool, you understand the physics crucial to this quickly growing sport. 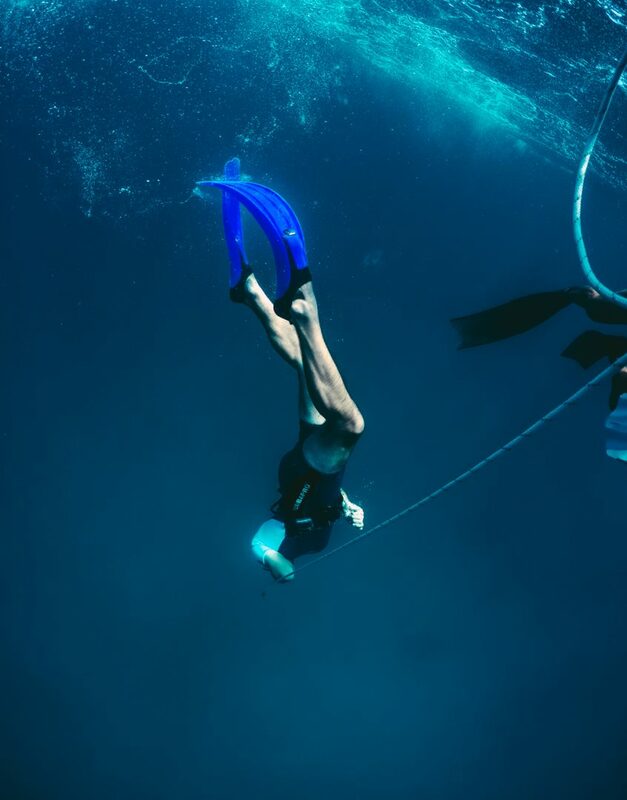 She’s been taking guests through their paces since Anantara became one of the first resorts in the Maldives to give free-diving lessons earlier this year. As your lungs shrink, so your buoyancy reduces the further you get toward the end of the rope attached to the buoy above. Here, at ten metres’ depth, you have neutral buoyancy. A few kicks up and your lungs begin to expand, sending you back up to the surface. A few down and gravity will return, taking you deeper and deeper with minimal effort. As much a mental as a physical sport, free-diving requires relaxation and control to practice. Tense muscles and a busy brain use a lot of oxygen – but luckily you’ve been relaxing hard since your arrival, and pranayama tuition is available at Anantara’s wellness centre. 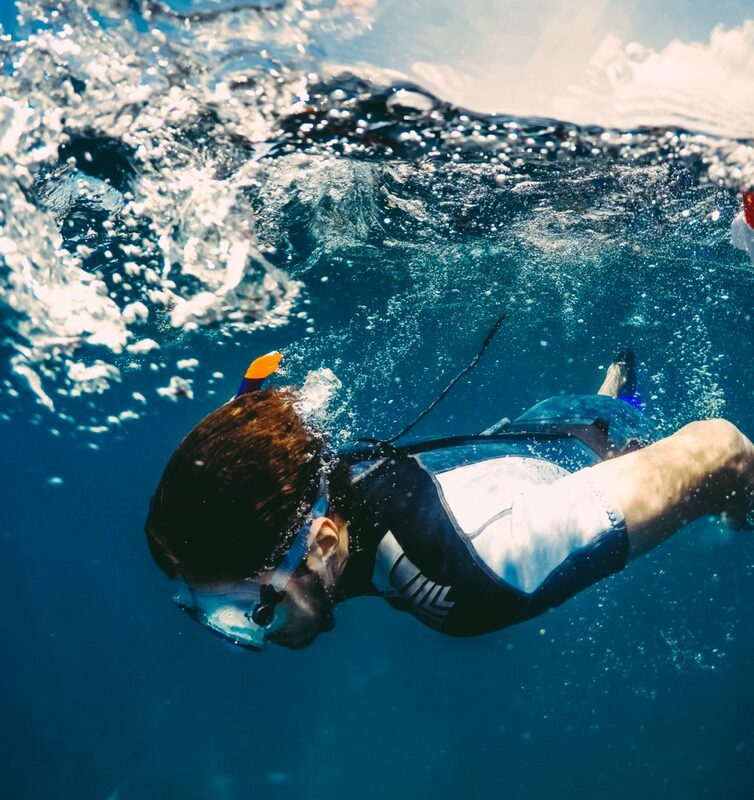 The mammalian dive response kicks in as soon as your face hits the water, reducing your heart rate to 25 percent of its normal level and slowing your metabolism to conserve oxygen. But concentration is needed to ensure you equalise the pressure in your ears and mask during the descent. Getting down here was the hardest part, and for a few precious moments you’re floating; a tropical spaceman. Up or down is your call, but only for as long as you can hold your breath, and your body is sending strong signals it would like to breath some time soon. Recalling your induction in the warm and plentiful air of the morning, you know that the oxygen levels in your blood have dipped only a couple of points and remain above 90 percent. But it’s the CO2 levels that are urging you back to the surface. The difference between a novice and a pro is their ability to withstand higher levels of CO2, allowing them to hold their their breath for long enough to dive to 25 metres or lower. The world record unassisted free dive is 95 metres, and the longest time anyone has held their breath underwater is 22 minutes and 22 seconds. While the discomfort is natural at first, being able to dive down to the reef has been a way of life for Maldivians for millenia, foraging for those hard-to-reach crustaceans, octopus and sea cucumbers on their doorstep. You may feel out of your depth, but didn’t that first session back at the gym leave you feeling like a fish out of water? Mari floats alongside you, checking you make the right decision and head back up. 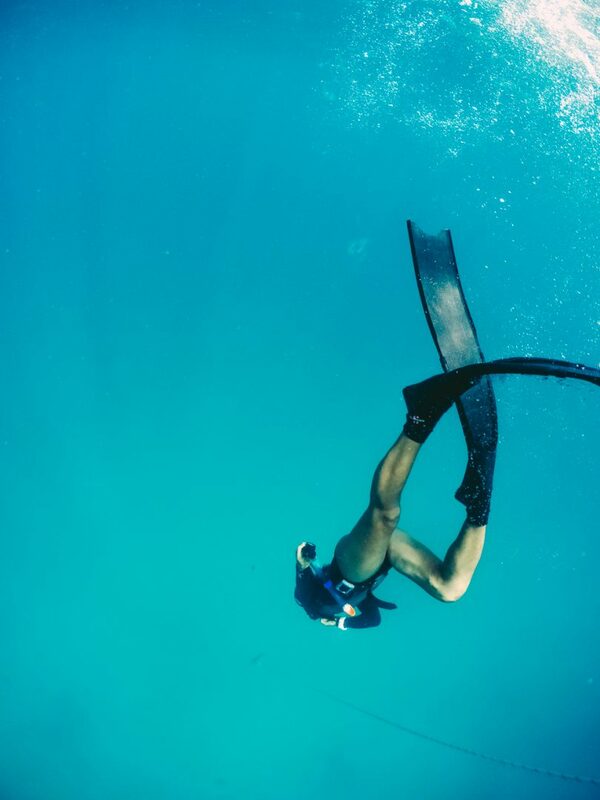 You do – flicking your fins and expanding your lungs as you race back up the rope leading into the sky. Full courses are available at the resort’s ‘Aquafanatics’ Water Sports Centre, allowing you to take your skills to new depths. These include training on technique and safety procedures to ensure you can free-dive with freedom.